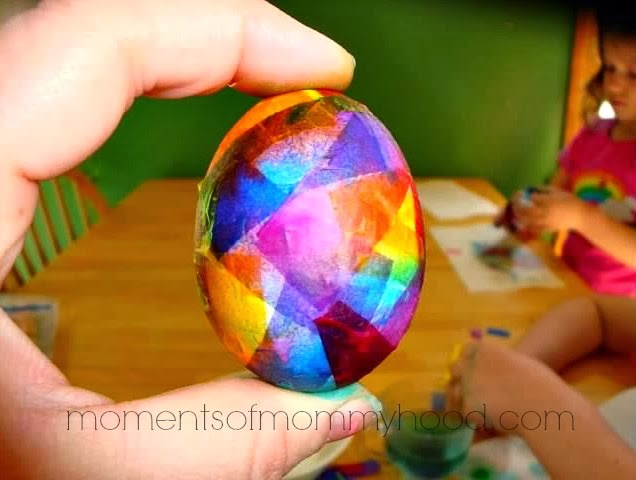 There are so many different ways to dye eggs for Easter and we are going to do a few of them. Today we covered eggs with tissue paper to dye them. It was a fun alternative to traditional egg dyes. You will need: Eggs, tissue paper, and water. 1. 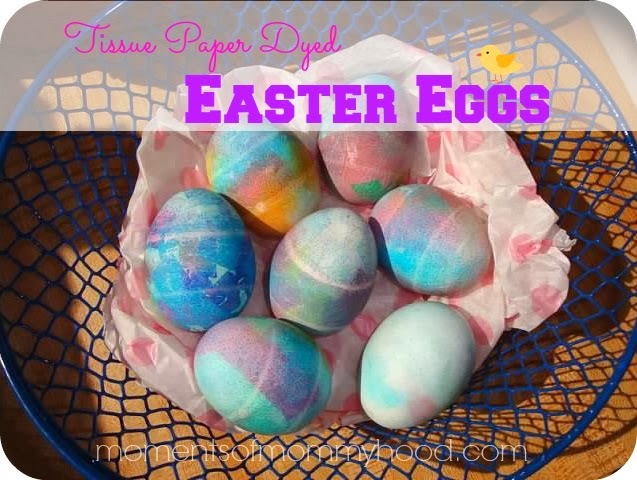 Dip pieces of tissue paper in water and begin covering the egg. 2. Continue until the entire egg is covered. 3. I used a paper towel roll cut into rings to hold the eggs while they dried. 4. When completely dry, peel the tissue paper off. We had a lot of fun using this technique, and although our fingers were slightly colored after we were done there was a lot less mess than dyeing eggs the traditional way. Try it and enjoy! FYI: Not all tissue paper will work for this. Stay away from the tissue paper you find in the gift wrapping section. The color will not transfer. Instead, look for "bleeding tissue paper". Really cute! They are so pretty I wouldn't even want to peel the tissue off! They turned out so pretty! 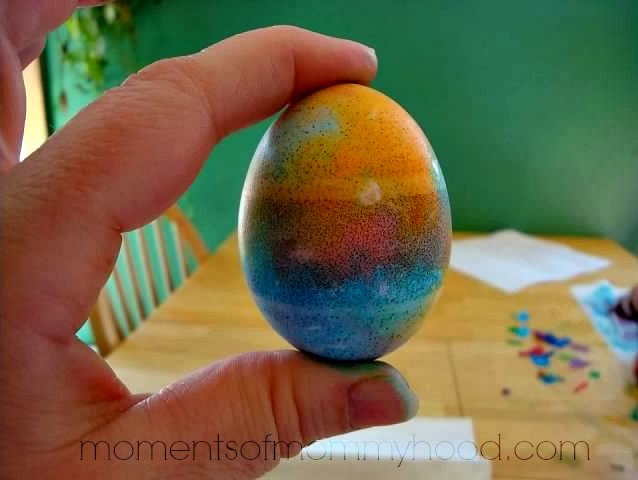 I love this idea for coloring eggs! I wish I would've known about it earlier this week when we did our eggs, or when I put together my post on 26 different ways to color eggs! lol I'm gonna share this on FB though and save it for next year! this is great and came out so so nice . We tried this. But my 2 year old got ahold of them and broke our creations. I used a few hollowed out eggs and was going to save them. Oh well. Wow that's so cool. You are rockin it for sure. This is a cute idea. Will try some day when the kids are old enough. Wonder, thinking it will even look good on brown eggs. WOW, forget Paas, that is awesome!! These are so pretty. Thanks for sharing. This is a great idea and your eggs came out pretty. 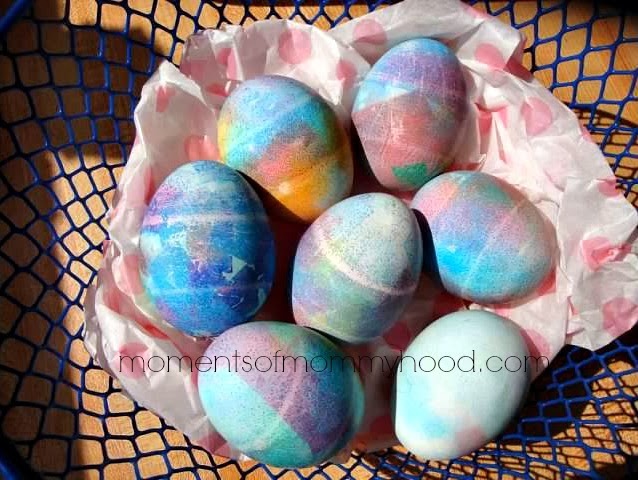 I've never seen eggs dyed this way before. I've linked up to your post on my weekly favorites here: http://play2grow.blogspot.com/2011/04/weekly-favorites-for-easter-2011.html Happy Easter! Aww, how awesome. I bet they were still beautiful with the paper on. Oh, what about cutting the tissue paper into shapes? I think I'll have fun with this next year:) Thanks for sharing! 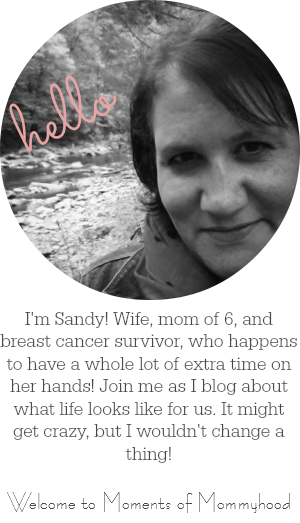 Thanks for linking to Creative Juice Thursday...Hope to see more of your ideas this week! do you need to use a certain kind of tissue paper? I tried this one year and nothing happend. I had did the once before and it was great. Thats why I was wondering if I got the wrong kind of paper. Is there something I need to look for when I buy it. Is this just the tissue you use for gifts? Would love to try this again. I use the tissue paper that you can find where you buy craft supplies. I have heard that the tissue paper you use for gift wrapping doesn't "bleed" so it won't work. Brilliant, and gorgeous photos. Happy Easter! I know this is an old post, but I hope it's still alright to post. I love your technique and would try it out at home this year. Have you tried doing this with notebook paper? I think it would bleed as you say, but I'm not sure. Only the blue color bled through. It didn't work for us either. We used tissue paper from Target and Hallmark. Are the eggs cooked or raw?